So laments the title track of Welsh rockers Budgie‘s 2006 album “You’re All Living in Cuckooland”. Unless you’ve lived under a heavy rock for most of the 21st century, it’s impossible to escape the almost constant media coverage of radical Islamist atrocities, sadly fed by real life events. Enormous demographic changes have been occurring on the streets of Australian cities as political parties of all persuasions have limp-wristedly opened the nation’s borders to pretty much anyone including huge numbers of immigrants and refugees, many from the largely troubled Muslim countries of the world. We’ve been asked why we include data about religion, amongst other characteristics in our data products. It’s because our customers have asked for them – we’re client driven. We already looked at the three largest faith groups, also the rapid rise in Chinese migrants. We’re now going to look in more detail at how two religious groups have fared over the period – Muslims and Jews. Many Muslim refugees are initially resettled in regional Australia. While some stay there and establish new lives, it seems that the bush telegraph soon spirits many to the expanding city suburbs where migrants identifying themselves primarily by the faith imposed on them by their countries of birth, congregate. It’s the same pattern experienced in Europe during the post world war 2 “collective post-colonial guilt” waves of mass immigration. France guiltily gave refuge to the Islamic populations of its former north African colonies, England did the same for it’s “Indian Empire” – effectively what is now Pakistan. There, and increasingly in other parts of Europe where the European Union allows free passage across borders, large areas of established cities and towns are now entirely Islamic in character and the indigenous populations have been effectively driven out. Here’s a map for New South Wales. Change to the percent of the total population identifying themselves as Muslims for three censuses. 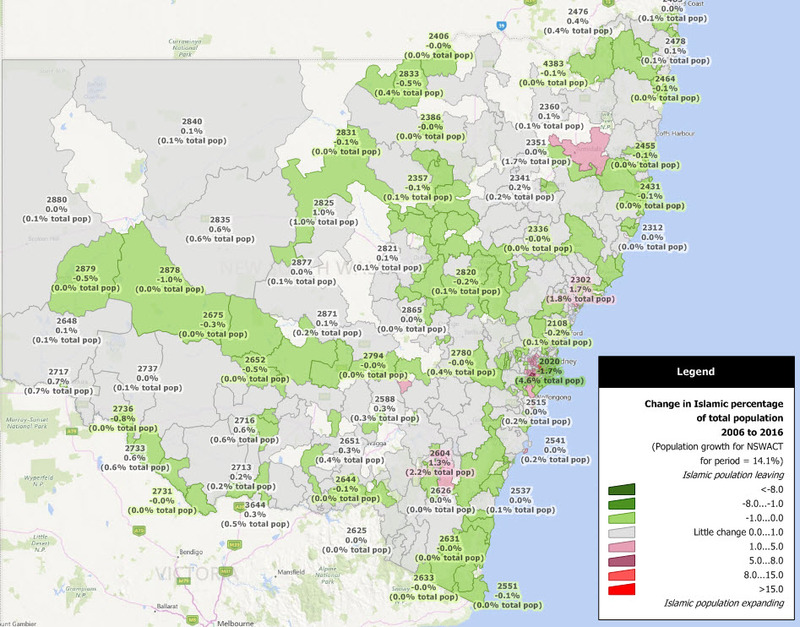 Green areas probably represent initial placement in refugee resettlement programmes, most of whom eventually move to the large cities to be near other people who identify as Muslim, rather than just Australian. 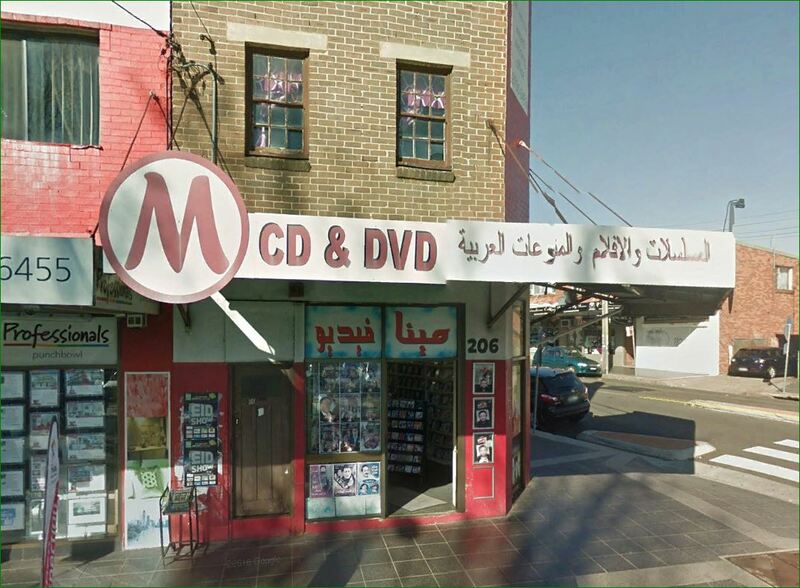 The concentration and expansion of suburbs rapidly acquiring an Islamic character – shop signs in Arabic is a certain early sign – is the same as has happened in many towns and cities of Europe. Apart from the sunlight, this Google Street view in Wiley Park, NSW 2195 could be many towns and cities in northern England. Here’s a closer view of greater Sydney. Change to the percent of the total population identifying themselves as Muslims for three censuses. Red areas are suburbs where Muslims tend to end up settling, regardless of where the humanitarian programmes that bring them here initially, place them. They prefer to be near other people who identify as Muslim, rather than just “Australians”. Now lets look at the same analysis for people identifying themselves as Jewish. Change to the percent of the total population identifying themselves as Jewish for three censuses. A radically different picture. We had to increase the the number of decimal places just to get most postcodes with a Jewish population to appear! With a population increase of 14%, the representation of Jewish people as a percentage of the overall population, is in steep decline. For Greater Sydney. 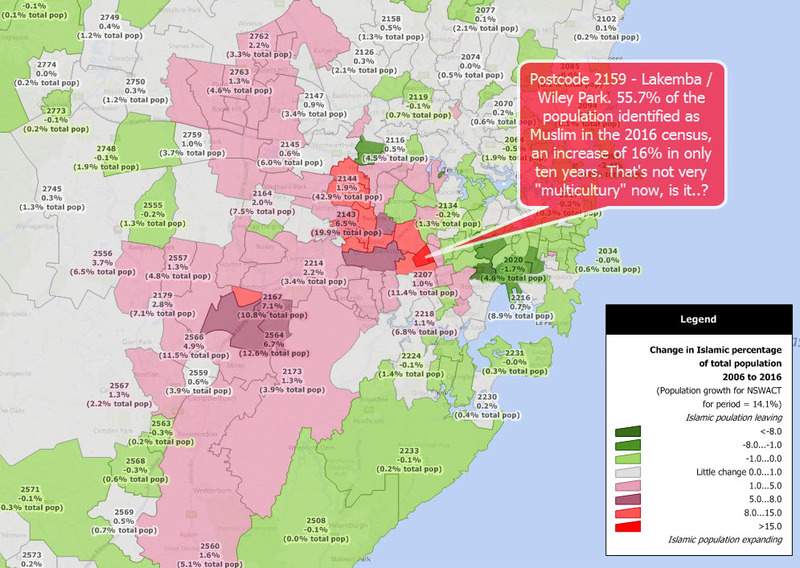 Change to the percent of the total population identifying themselves as Jewish for three censuses – Greater Sydney. If the Jewish community want to keep their Synagogues open, they need to start having a few earlier nights, or maybe they’ve been leaving the “Lucky Country” and going home to Israel. Leave a comment if you can shed any light..
Want to know what’s really happening in your own neighborhood? Get a MapMakers data product!